Every year in late spring and summer, biologists and technicians traipse across mountains, prairies and deserts to survey birds under the Integrated Monitoring in Bird Conservation Regions (IMBCR) program. The program, coordinated by Bird Conservancy of the Rockies, is one of the largest of its kind in North America, stretching across public and private land in many states in the western United States. This map shows coverage of the Integrated Monitoring in Bird Conservation Regions (IMBCR) as of 2017 across multiple Bird Conservation Regions for Bird Conservancy of the Rockies. What the Bird Conservancy and our partners learn through the IMBCR program informs management decisions and contributes to the big picture for bird and habitat conservation. Data gathered as part of the program are available at no cost through the Rocky Mountain Avian Data Center. Strengths of the IMBCR program include a statistically rigorous design based on random sampling, a broad network of partners that support the program and its reach across many states and boundary lines, including public and private lands. Partners include (but are not limited to) the U.S. Forest Service, National Park Service, state wildlife agencies and organizations such as the Avian Science Center, Intermountain Bird Observatory and Wyoming Natural Diversity Database. View more reports on the Bird Conservancy’s Reports page. Access protocols from the IMBCR program at the Rocky Mountain Avian Data Center. generate decision support tools that help guide conservation efforts and provide a quantitative measure of conservation success. In 2007, the North American Bird Conservation Initiative developed the report Opportunities for Improving Avian Monitoring. This report outlined goals and recommendations to further improve avian monitoring programs including: using more rigorous statistical methodology, integrating monitoring programs, and making data and results widely accessible to land managers and the public. 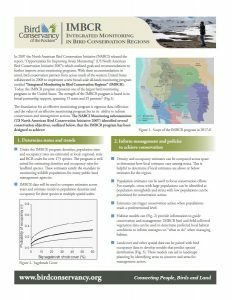 With these recommendations in mind, bird conservation partners from across much of the western United States have collaborated to implement a broad-scale, all-lands monitoring program known as Integrated Monitoring in Bird Conservation Regions (IMBCR). The IMBCR program was first pilot tested in Colorado in 2008. It has since expanded to include several states and national forests. The IMBCR program’s design has since updated many long-term monitoring programs, such as Monitoring Colorado Birds, Monitoring Wyoming Birds and the Northern Rockies Landbird Monitoring Program. Using the intersection of Bird Conservation Regions and state boundaries as the primary level of stratification, substrata are defined by IMBCR partners based on areas to which inferences are needed, such as an individual national forest. Spatially balanced samples are selected within each substratum using a generalized random tessellation stratification algorithm. This sampling design allows direct comparison of density and occupancy estimates among geographic areas and across spatial scales. Birds are surveyed from a grid of points within each sample unit during a 6-minute period. Observers record distances to each bird and the 1-minute interval during which each bird was detected. These data are used to estimate occupancy rates at two spatial scales and density using distance sampling theory. Buckland, S. T., D. R. Anderson, K. P. Burnham, J. L. Laake, D. L. Borchers, and L. Thomas. 2001. Introduction to Distance Sampling. Oxford University Press, London, UK. Stevens, D. L., and A. R. Olsen. 2004. Spatially balanced sampling of natural resources. Journal of the American Statistical Association 99:262-278. U. S. North American Bird Conservation Initiative Monitoring Subcommittee. 2007. Opportunities for Improving Avian Monitoring. U.S. North American Bird Conservation Initiative Report. 50 pp. Available from the Division of Migratory Bird Management, U.S. Fish and Wildlife Service, Arlington, VA; on-line at http://www.nabci-us.org/. Want to be added to the IMBCR listserv? Contact Jen Timmer.